The lecture 'Inland Waterways' and the lecture notes discuss the design of inland waterways and canals, and the necessary adaptations for natural waterways to meet the shipping demands. 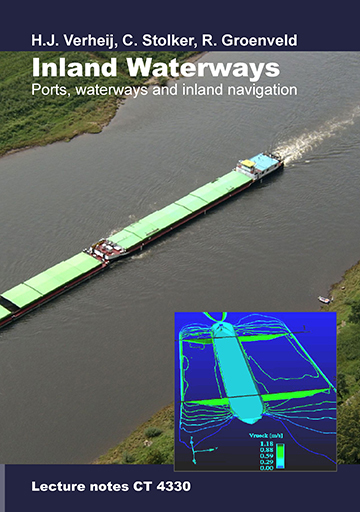 After an overview of the most important inland vessel types and ship characteristics, the lecture notes deal with hydraulic phenomena, as they occur during navigation in confined waters. Hydraulic phenomena limit the speed and subsequently the size of vessels in canals and they determine the (minimum) dimensions of new canals. Some theory and equations to calculate these hydraulic phenomena, or to obtain a first-order impression of the magnitude, are presented. Based on the hydraulic phenomena and extensive model tests and field measurements a number of standards for the design of canals are discussed, focussing on European circumstances. With respect to the instructions for the design of inland waterways, the directives given by the 'Commissie Vaarweg Beheerders' (Committee of Waterway Managers) of the Directorate General for Public Waterworks and Water Management, are elaborated and applied.